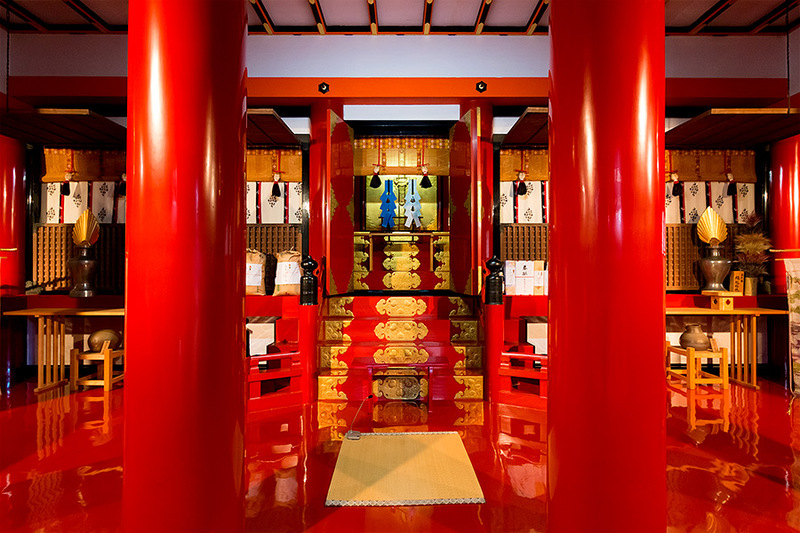 Rebuilt in 1425, Kibitsu Jinja Shrine’s treasure hall represents the only surviving example of the kibitsu-zukuri architectural style. 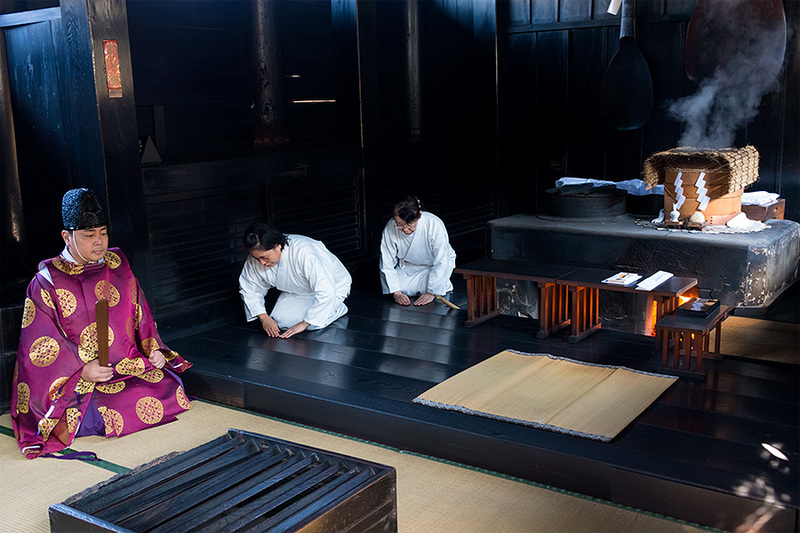 A purification ritual prepares visitors to visit the ancient kitchen built atop the site where Ura’s head is buried. The covered walkway at Kibitsu Jinja Shrine, rebuilt in 1597, provides a lovely stroll year round. 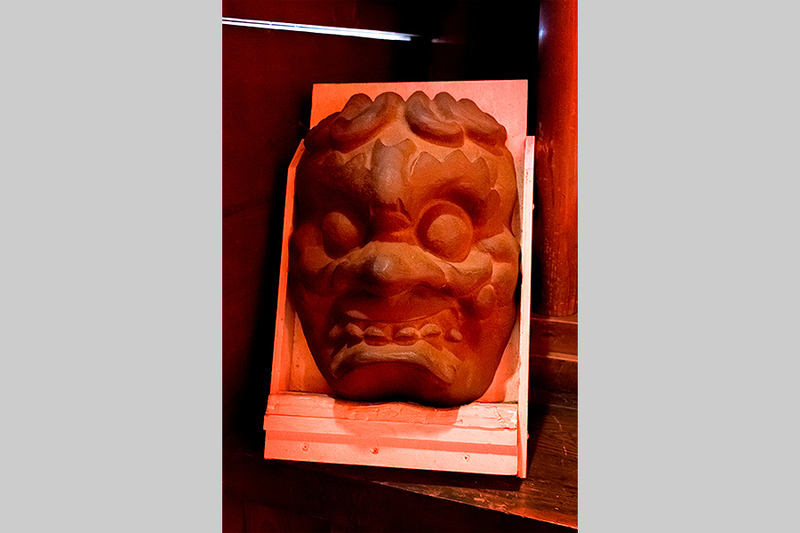 Associated with the famous story of Momotaro, Kibitsu Jinja Shrine naturally offers talismans depicting the story’s titular folk hero. Very few shrines retain these ancient kitchens, and only Kibitsu Jinja Shrine performs this unique fortune-telling ritual. The beautiful red interior of the ancient treasure hall, though generally off limits to the public, houses many breathtaking artifacts. 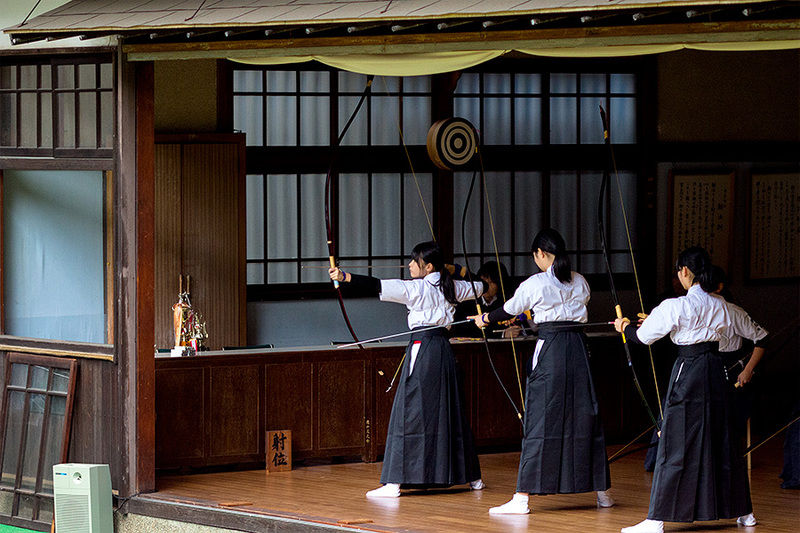 In honor of the resident god’s epic marksmanship, Kibitsu Jinja Shrine regularly holds archery competitions. The demon’s name is Ura, and aside from being as scary as, well — a demon — he also apparently can see the future and share its secrets with you. But first let’s back up a little bit — say, 1600 years or so. You see, back then, this area belonged to the Kingdom of Kibi, and it was a pretty peaceful place until big bad Ura rolled into town. To set things right, a powerful warrior named Isaserihiko-no-Mikoto beseeched the gods for help, and they granted him magical powers and mentioned that, for best results, he should fire two arrows at once during his battle with Ura. Now, I say he “beseeched the gods,” but I’ll be honest — there really isn’t a perfect word in English to describe the Shinto idea of divine entities, or kami, the meaning of which falls somewhere between “gods,” “spirits,” and “the energy and life-force of the natural world.” (Hmm…) So we’ll be using the term “gods” a bit loosely going forward, just FYI. In any case, Isaserihiko-no-Mikoto traveled to Kibi, and the battle commenced. Ura slung an enormous stone, and Isaserihiko-no-Mikoto fired the first of his mighty arrows. The projectiles met in midair and fell into the sea. Remembering the divine advice he had received, Isaserihiko-no-Mikoto quickly fired his second arrow. The shaft struck Ura’s eye, the blood from which formed the Chisuigawa (“Blood River”). Ura transformed into a pheasant to escape, so Isaserihiko-no-Mikoto became a hawk. Ura morphed into a carp and dropped into the river to swim away, but Isaserihiko-no-Mikoto transformed into a cormorant and caught him. From thenceforth, Isaserihiko-no-Mikoto became known as Kibitsuhiko-no-Mikoto, and everyone lived happily ever after. For you see, though Ura’s body was gone, his head remained — and this is where things start getting creepy. Ura’s head, though bereft of its body, began emitting a deep, ghastly groan. So, Kibitsuhiko-no-Mikoto ordered one of his retainers to sick his dog on Ura’s head. Yet even when reduced to a slobbery skull, Ura continued to groan. After all, when it comes to emitting horrid, underworldly sounds, all that fleshy, facey stuff just gets in the way. At last Kibitsuhiko-no-Mikoto decided to bury Ura’s head in hopes it would finally shut up. But in Shinto, to bury the dead is to show respect, and as a result, that night Ura showed up in Kibitsuhiko-no-Mikoto’s dream with a surprising proposal. 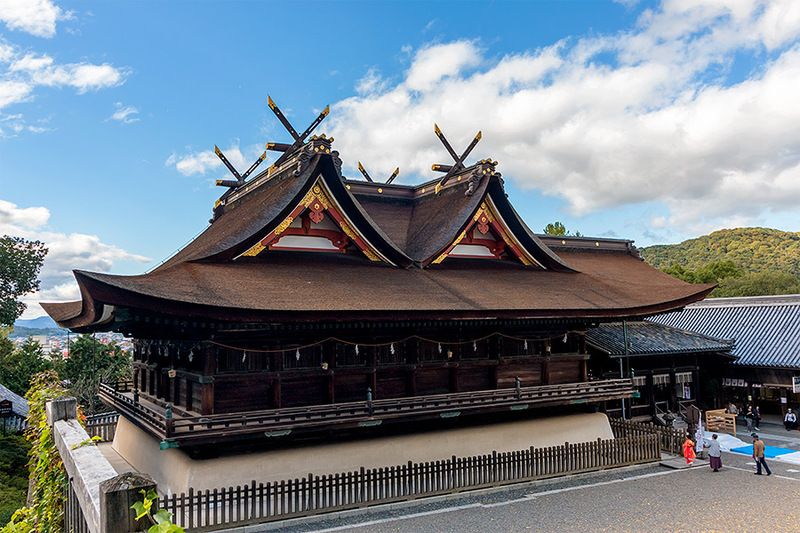 Accordingly, Kibitsu-jinja Shrine was built with a kitchen atop the spot where Ura’s head is buried. And to this day, his groans reverberate from beneath the ancient stove — as you’ll see in a moment. 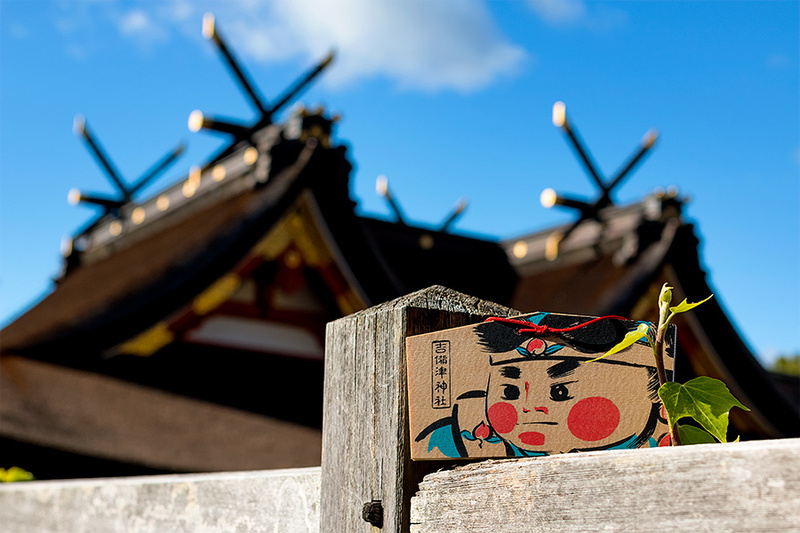 Later on, this story gave rise to the popular folktale Momotaro, or “Peach Boy.” In fact, Kibitsu-jinja Shrine even offers omamori (talismans) with Momotaro designs. Arriving at the shrine, I sign in and make a suggested, sliding-scale monetary offering, the size of which, I’m assured, has no effect on Ura’s disposition toward me. Good to know, since “angering an ancient demon” has yet to make my bucket list. On the form I have to write down a wish, and later during the ceremony the voice of Ura will inform me whether or not it will come to pass.. English is fine, I’m told. “Will I ever finish that manuscript I’ve been kicking around?” I write, and hand the form over. Kensuke Uenishi, the Kannushisan (Shinto priest), meets me and my partner in the courtyard, and together we admire the gorgeous architecture of the honden (main sanctuary). The most recent reconstruction dates back to 1425. With a combination of both Japanese and Chinese architecture, and a distinctive roof featuring four gables, the Kibitsu honden — a registered National Treasure (an official title given to the most precious of Japan’s important Cultural Properties) — represents the only surviving example of its kind. Uenishi seems very relaxed — not what I would expect from someone at a religious institution, especially one harboring a demon. I tell him so, and he laughs. Uenishi takes me to a room and performs a purification ritual to get me ready for the demon ordeal — and after that, I’m on my way to meet Ura. We head outside to a beautiful covered walkway. 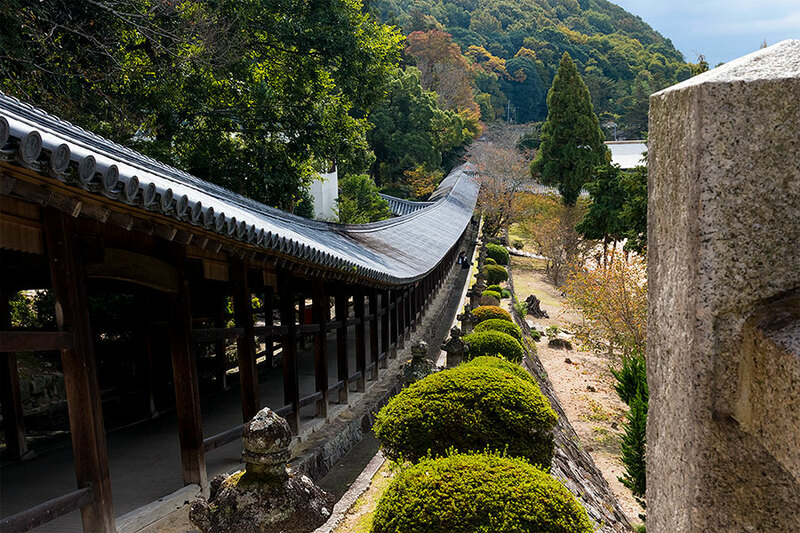 Rebuilt in 1579, the 360-meter-long path passes alongside an archery range — a tribute to Kibitsuhiko-no-Mikoto’s legendary marksmanship. Yet Kibitsu-jinja Shrine offers plenty to see beyond archery, including a 600-year-old ginkgo tree, and flowers galore (for a guide to what’s in bloom when, see the footnote below). 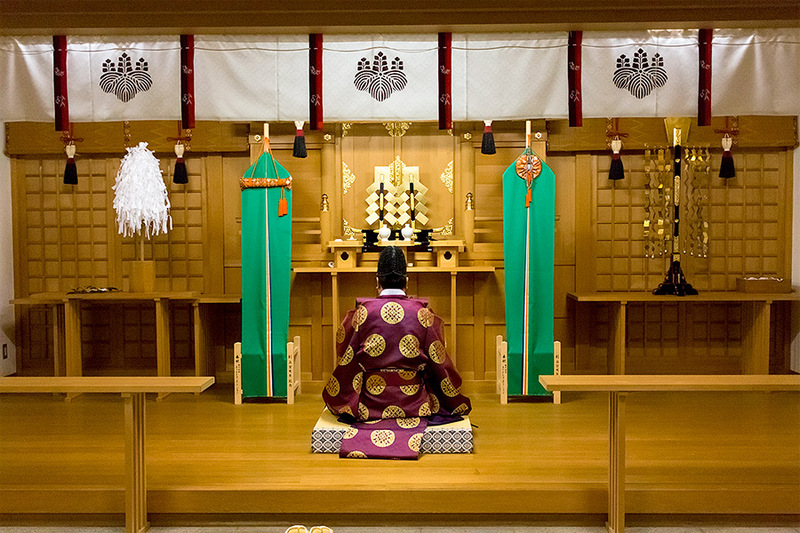 Additionally, on second Sundays of May and October, Kibitsu-jinja Shrine hosts Tokushushinsen — a ceremonial offering of prepared food for the gods, now quite rare in Japan. For the event, they cook up 75 dishes on the wood-fired stove in the ancient kitchen, a place now registered as an Important Cultural Property. 150 people (two on each side of every dish) carry the feast to the honden for Kibitsuhiko-no-Mikoto. When asked what foods the gods like best, Uenishi replies thoughtfully. The continuation of this ancient ritual is one of the reasons Kibitsu-jinja Shrine maintains its traditional kitchen. That, and the severed demon’s head buried under the stove. As I step into the ancient kamaden kitchen, the mood gets tense. Here, light filters in through slat windows, illuminating the smoke from the eternal flame burning in the ancient stove — smoke which has, over the course of more than 400 years, lacquered the wooden beams black. The kannushisan and two assistants commence the ritual. He begins reading an ancient incantation, as one of the assistants adds dry rice into the pot and begins to stir. Slowly at first, but with gathering force, the low guttural groan of Ura fills the room. Alarming though the sound certainly is, I’m surprised to find that it doesn’t feel sinister — at least, not to me. In fact, if anything it feels sort of… warm, in a way. Not at all what I expected. At last the sound dies away, we all bow in respect to Ura, and step back into the daylight. “What did you feel when you heard him?” he asks in reply. “Then you have your answer,” he replies. My partner and I bid farewell to Uenishi, and together we walk around the shrine a bit more before grabbing lunch at a restaurant nearby. “Are you going to read on the train?” she asks. “Nah, I think I’ll work on my manuscript,” I reply, with only a hint of a demonic grin. Access: 10 min on foot from JR Kibitsu Sta.